Why: Life requires energy. Oil is finite. Life and economies powers by oil are terminal. Survival depends on profitably providing mobility within a energy self-reliance – within a solar budget. 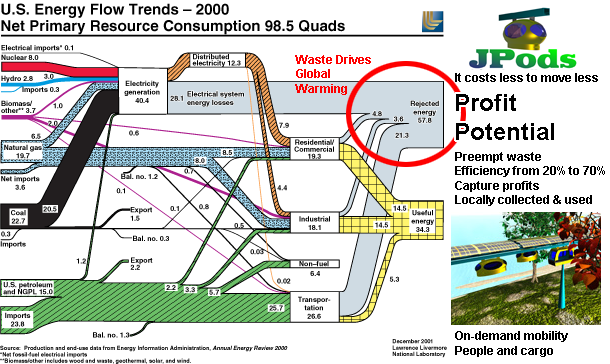 As illustrated in the following diagram, over 80% of current oil is wasted with the assumption that cars are efficient. If you recognize that cars are 140 times less efficient as moving a person than freight railroads move the same mass, then over 99% of current energy costs can be viewed as potential profits and/or customer savings. Mission: Profit by supplying safe, congestion-free, comfortable, convenient, energy efficient, on-demand personal mobility and cargo transport in highly repetitive travel of less than 50 miles. Solving someone's problem. Niche solutions for congestion and increased personal mobility. There are thousands of connections needs for this at airports, between transport hubs, medical complexes, business parks, industrial centers, military installations, etc.. Payback range from one to three years. Solving general problems of congestion, Global Warming and Peak Oil by automating highly repetitive travel in wide area networks of cities and towns. About four billion of the eight billion miles Americans drive every day can be automated a profit/competitive advantage of 27 cents per passenger mile. Short-term there are thousands of networks that can be built with a 1-5 year payback. Long-term the US market size looks to be about 500,000 miles. The 140,000 miles of freight railroads (averaging 480 ton-miles per gallon) will be the logistical arteries as oil costs rise and supply shocks impact. There needs to be about 4 times this amount of JPods rails to be the logistical capillaries. There are nearly 2 million lane miles of urban roads that the oil to power has increased in costs 494% in the last 15 years. JPods rails equal to about 25% are necessary. A 500,000 mile network will cost about $5 trillion to build and save $600 billion a year of imported oil creating an 8.3 year payback. There will be additional savings by cutting defend costs for foreign oil ($700 billion per year), accidents ($300 billion per year), congestion ($121 billion per year), pollution and other expenses. To repair oil-powered infrastructure will cost about $3.6 trillion by 2020 without the savings. How JPods Inc Makes Money: Primarily JPods Inc will license its intellectual property for implementation by Local Mobility Companies. PoolCars.net. Sales of software and electronic so cars can be shared by anyone one on a campus and that use is billed to their account. Rescue-Rail and Levee-Rescue. Sales and leasing of temporary networks for special events and disasters. Mobility Alliance Partners. License sponsors and manufacturing rights of JPods components. Local Mobility Companies. Royalties and license rights to deploy and operate JPods networks in specific geographic regions and/or markets. LMC Markets. Manage an exchange for the purchase and sale of Local Mobility Company rights. 65 additional patents outlined waiting for capital to file. Built, programmed and demonstrated Proof of Concept JPod, software, sensors and rail (Fox News Story). Engineering tools, drawings and structural analysis complete for the first round. Management team and Directors partially complete. Defined cost and pricing mechanisms for evaluating payback on Boston, Secaucus, and vintage examples. Very old Letters of Interest and support obtained from commercial and governments. Exchanged a Letter of Intent to found first Local Mobility Company (San Jose, CA). In Jan 2007 it is expected to have a $10 million project fund. Define and have an agreement on the value of a Local Mobility Company at about $7 million per 100,000 population. Established a channel for rapidly expanding the number of LMCs through veterans' networks. Preliminary written agreement to build first solar powered mobility network at the Mall of America and the Grand Lodge. Discussions with Kaiser Aluminum, ALCOA, Waste Management on Mobility Alliance Partnerships. Marketing agreement signed for Germany, Austria and Switzerland. $3,000,000 2 years Implement MOA network, patent submissions, secure construction financing for network expansion, sale of 50% share of MOA LMC for $7 million and additional fundraising. $7,000,000 3 years Same as above and start LMCs with $500k in Salinas, Santa Cruz, Sunnyvale, Pleasanton (California). Pursuit and fund with $500k three of the sites studied for EPA. $20,000,000 3 years Same as above and build 30 miles of networks. Sell these networks to LMCs and permanently shift JPods from a builder to an intellectual property company that licenses LMCs to build networks. Public Offering 5 years Implement a public offering when we have 1,000-5,000 miles of rail credibly licensed. Invest in your community JPods is selling Local Mobility Company (LMCs) rights to exclusively deploy JPods networks into specific territory. Funds will be developed in each LMC to deploy networks into that LMC. LMCs are the the Physical-Internet what ISPs are to the Internet. Review Case Studies for examples of networks LMCs will own and operate. Invest in JPods Inc JPods is raising $20 million in capital to expand, refine and document its technology and intellectual property rights. Approximately $10 million of these funds will be used to help seed LMC operations. Executive Summary Three page summary of JPods Inc market, team and business plan. Business Plan Detailed description JPods Inc market, team and business plan. Payback multiples are estimates. Explanations are provided below each chart. Our primary concern is for the first three sets of multiples as they will drive early adoption. The last two sets cannot be managed by us, but as we affect public policy objectives in these areas there may be government incentives to accelerate deployments.